Net View and Control (NVC) allows the user to monitor and control the touchpanel anywhere in the world where there is internet. This feature is available in Uticor Touchpanels irrespective of the Operating System. In case of Touchpanels using Proprietary Operating System the panel has two processors. One is used for HMI functionality including communication to the PLC whereas the second processor residing on the RMC option card is used for Remote Monitoring and Control In the case of Uticor Touchpanel CE Operating System the same processor handles both functions. The UTNVC web server card (UT-NVC) plugs into the extension connector of the Uticor Touchpanels. It has an Ethernet Port that allows a PC anywhere in the world to view any screen in the Panel in Real-Time as well as control the operation of the Panel using your mouse. This card can also be configured to send Emails from the Panel. As a side benefit RMC card also gives you the ability to store up to 2GB of Data in an optional SD card on-board. With UTNVPS software (UT-NVPS) installed in your PC you could monitor any screen on the Touchpanel addressed by the software in Real Time allowing system troubleshooting and/or management review of the machine opertaion. 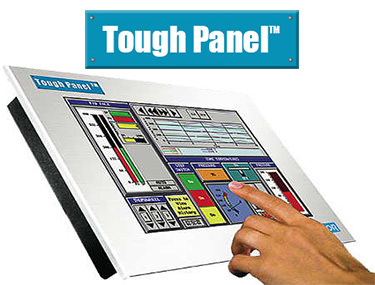 Uticor HMI Touchpanels provide this capability in a very simple Format. You do not even need to have an Ethernet option on the HMI. All you have to do is to connect the RS232 port on the Touchpanel to your PC. UT Daq Software when installed on your PC can select any tag you want to monitor on the PLC / Panel, watch the data coming in real time (as compared to receiving only a snap-shot of the available when certain event occurs) and plot it into an X-cel sheet automatically. Time intervals on event triggers can be selected from a wide range of option. For multiple panels or if you wish to collect data over Ethernet, UT DAQ will service that as well. UT-DAQ-SOFT Description: UTDaq software collects and saves tag data from one or more (connected and running) Uticor HMI panels. The user specifies tags and schedules for data acquisition. Data files are organized in a convenient, user selectable format (tab delimited or CSV) and can be opened in Excel or in any text editor. UTDaq uses the RS232 programming port to a PC or Ethernet for communicating with multiple panels allowing the data acquisition PC to be far away from the panel. Uticor Touchpanel would require an Ethernet to serial adapter. UT-NVPS Description: With UT-NVPS web server software installed in your PC you could monitor any screen on the Touchpanel addressed by the software in Real Time allowing system troubleshooting and/or management review of the machine opertaion. UT-NVC Description: UTNVC web server option card plugs into the extension connector of the Uticor Touchpanels. It has an Ethernet Port that allows a PC anywhere in the world to view any screen in the Panel in Real-Time as well as control the operation of the Panel using your mouse.This card can also be configured to send Emails from the Panel. The card also gives you the ability to store up to 2GB of data in an optional SD memory card. Note: this web server card cannot be used on panels that already have another option card such as DH+ / R I/0. UT-SOFT-PLANT Description: UTPlantView allows you to monitor a limitless amount of panels simply by identifying their IP addresses. It then shows the status of those panels with user defined colors and conditions. Can be installed on any Windows based PC in combination with any Uticor Touchpanel equipped with the UTNVC Web Server Card.